The candidate with a graduate degree in 10+2+3 pattern is eligible to apply for admission to this course. The candidate is required to have a first class Degree in Mathematics/Statistics/Applied Sciences/Computer Science/Information Technology. The eligibility criteria at Nehru college of Aeronautics and applied sciences is to pass 12th board exams. There will be an entrance exam to get admission. Does Alagappa University provide distance education or not? The Alagappa university distance education is available but for some courses, not all the courses. Yes, Alagappa university offered the distance education for the course MBA. Alagappa University PHD result 2016? How do I get my Alagappa University PHD result 2016? Alagappa University, Chennai, contact number, please anyone? You can contact with Alagappa University, Chennai by using this number. 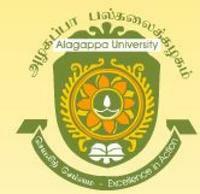 What is the Alagappa University, fees and eligibility for distance education for UG course? Please refer this website for getting all information regarding Alagappa University, [AU] Karaikudi distance education UG and PG courses.